Dresses - CANGIARI STORE - Made in Goel s.c.s.p.a. 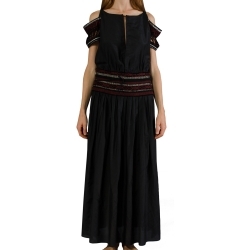 Organic Whool, Alpaca and Organic Linen dress with handwoven carré and patch pockets. 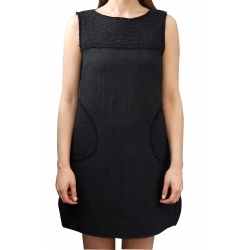 Organic Silk dress with raw-cut edges. 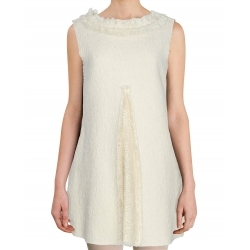 Organic Silk dress with raw-cut edges and scooped back. 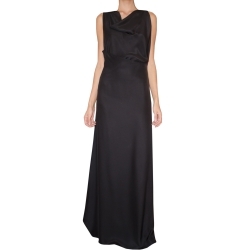 Organic crepe satin halterneck dress with handwoven detail on the buttons. 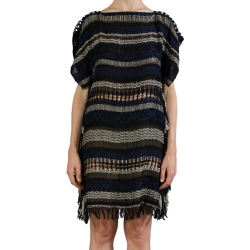 Long Raw Cut Dress with multicolor handwoven fabric in the back. The particular chromatic shades of the handwoven back panel are made mixing extra fine yarns in different colours, creating unique fabrics. Composition 100% Organic Silk Satin. Organic cotton petticoat with simple fit. Plunging v-neckline starts from thin straps. Made in Italy. Read more!